Not a long while ago the leaked pictures of the Sony’s new smartphone called the Sony Xperia Z1s were leaked on the internet. The S version of the Xperia Z1 is known to be a mini one, but watching them both alongside each other we really didn’t notice any difference except the small screen size with a lower resolution then the original Xperia Z1 and a lower battery capacity. Other than that they are both powered by the same processor, both of them have the same camera as well. There are no actual details about all the specs of the Xperia Z1s but it’s rumored to have a 4.3-inch 720P display, 2 GB of Ram, 2.2GHz quad-core Qualcomm MSM8974 processor, 16 GB of storage space that can be upgraded via a micro SD card till 64 GB and a 2300mAh battery. The smartphone is also said to be dust and waterproof. We don’t know about the actual specs but what we do know is that the existence of Sony Xperia Z1s is confirmed because Sony updated on their website about it. The Sony Xperia Z1s is expected to be priced around $590 and the release date for the smartphone is expected to be Q1 of 2014. 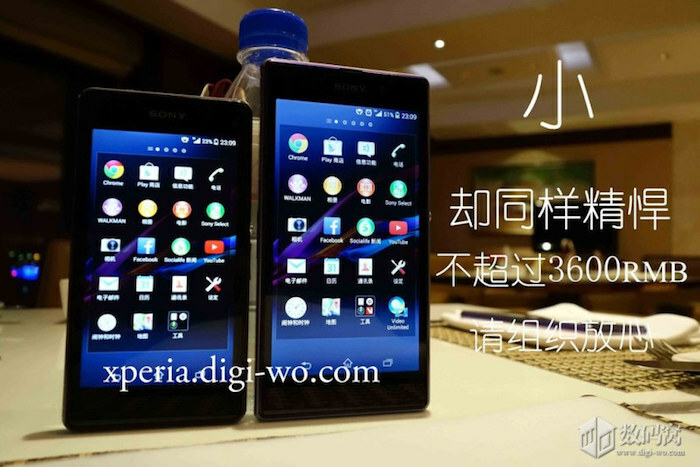 There are three pictures leaked showing the Xperia Z1s alongside with the Xperia Z1. In the first picture you will see the dialer while in the second picture you see the Xperia Z1s next to its flagship twin the Z1 and in the third picture you see the measurements of the two smartphones. We don’t know yet what Sony’s goal is here, why release two smartphones with the same specifications except the difference in screen size. This might be something new that Sony thinks might change the trend of smartphones nowadays in which companies like HTC and Samsung release a mini version of their flagship smartphones but with half of the specs the actual smartphone have, or maybe some customers out there prefer better specs with a small screen, because not everyone have big hands to handle the big smartphones. I am surprised that Sony is bringing this out so quickly after the Z1. Like you say doesn’t make sense. Looks like its shipping with Jelly Bean too rather than KitKat. But guess it will get the upgrade fairly soon.